A blog is something that can be run by a single person if necessary, but developing buy-in and getting your entire team onboard will only help strengthen your blogs. Having a group of people working on blog posts will help highlight different outlooks and provide various ideas to make a well-rounded blog queue. Now, in order to develop this buy-in you should show your employees and co-workers the numbers and explain how a blog will help your business. Next, you must ensure that your blog is centered on passion. This means that you are writing about something you want to write about – writing about your business’s core values and principles will generate a voice and highlight your team’s passions. This will not only make blogging more enjoyable but also help you in connecting with your audience. Your blog should have a purpose and clearly outlined goals. Using these two as paths, start formulating ideas for your blogs and what you think would make good topics. The ideas can be related to practically anything, but you should ensure that they tie into your business one way or another. This is also where getting your entire team onboard comes in hand. You should all get together and brainstorm, writing these ideas down in order to use them for future blogs. Here at Omnibeat we do something similar as we have a content library in which we have numerous blog ideas for the future. Nobody wants to read something boring and bland. Use action words and strong headlines to gain your audience’s attention and keep it throughout the entire article. Rather than “Business Blogging” try “Blog as the Expert in your Field.” In addition, scatter calls to action throughout your blog to keep the audience engaged and interacting. Each blog should have a clear goal whether it be to gain subscriptions, inform the audience, make sales, or whatever. Blogging is simple, and can often be too simple. This is why you want to ensure that you are keeping your blog strong and interesting and prevent yourself from growing lazy and allowing it from being another bland blog with no real effect on the audience. The numbers speak for themselves – there is really no reason not to start a blog for your business. A simple weekly article will boost not only your site traffic but in turn your sales. 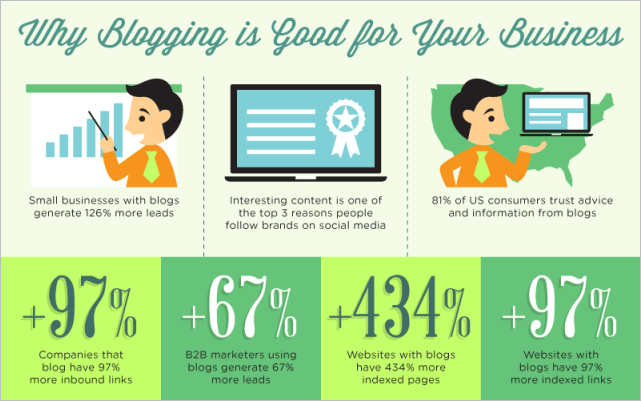 It may seem like a waste of time, but blogs can lead to massive results if utilized correctly. Blogs are unique as a blog from months ago will continue to drive traffic to your site today. This is why you need to start writing and blog as the expert in your field.